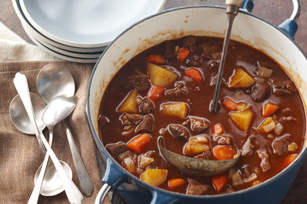 Beef Stew, that is. And one of my childhood favorites. Although I hated the smell that would wake me up in the morning from the crock pot, I do love the way it goes down on a chilly night. I’ve never tried to make it before, and I didn’t really have a recipe, so this effort was just something that happened to work (part, courtesy of Kraft and part, courtesy of my stew-stacked fall of 2013). And, if you’ll let me dust my apron-clad shoulders off, it worked really well. …I’m coming back in before this posts to say that we should have a moment of silence and toast to crock pots everywhere as you make this recipe. Sadly, as I cleaned out the last remnants of a dish well enjoyed and flipped on the garbage disposal… the crock pot basin hit the floor, where it entered it’s next phase of life – that of a thousand pieces of stoneware. It’s a tough fate – both for the crock, and for our palates. Your support and encouragement is appreciated. And if anyone (particularly, you Jarden/CrockPot) wants to buy me a new one, that’d be cool. This recipe is for 2 people, but you can double it pretty easily to make a larger stock. Do onion, garlic, EVOO, S&P in skillet, but then throw everything into the crock pot together and cook on low for 8 hours. We served it with good ole Jiffy cornbread. It’s really good if you wait to eat it at the end, when you can soak up all the leftover broth. Yum.